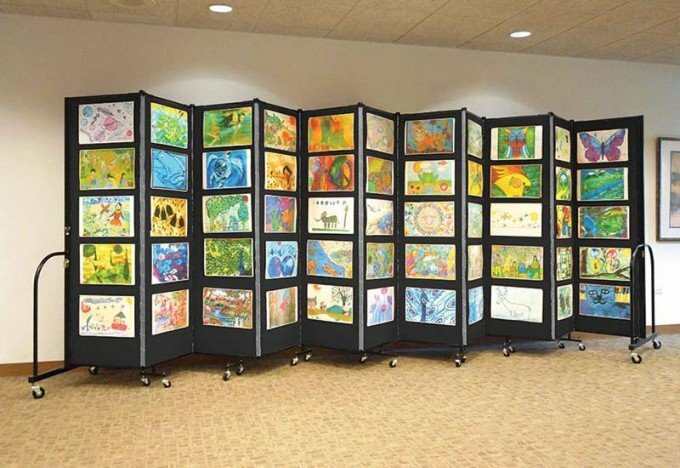 Use Screenflex black room dividers for artwork display panels, post flyers or display decorative items. The dark fabric is a great contrast to the display items and really makes them pop! Items are easy to tack, staple or pin to the honeycomb core surrounded by two layers of insulation and your choice of color fabric. Choose from our selection of 38 color choices of 100% recycled polyester fabric. We offer four different lines of fabric colors; designer, our most popular line; Excel, Select, and Pinnacle. All of them are a weave pattern that appears solid except for the Pinnacle which has a small pattern to it. You may also select from one our 6 fire-resistant vinyl colors. Add an additional antimicrobial coating to keep germs at bay, or select an optional factory applied for Scotchgard protection against dirt and grime. Our black room dividers category includes the colors; Charcoal Black, Black, and Black Pearl.